Baptistry Heater Kit heats virtually any Baptistry and includes the Portable Baptistry Heater with the circulating Drain Pump and 2 Hoses, as well as a FREE Floating Thermometer. NOTE: If you are purchasing or have purchased the Portable Baptistry, a Drain Pump is already included with your Baptistry, thus you should only need to purchase the Portable Heater with included Hoses. See Baptistry Heaters. 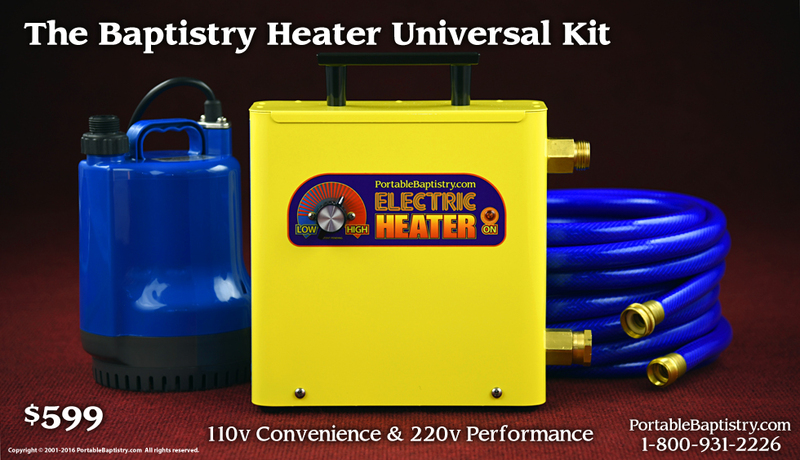 The Portable Baptistry Heater is 2 Heaters in 1: 110 volt and 220 volt. For the ultimate convenience, it requires no installation out of the box, and conveniently plugs into any 110 volt outlet (3 prong) anywhere, anytime. For the ultimate performance, it may also be easily converted for use on 220 volts, by a qualified electrical technician. On 110 volts, it heats the Portable Baptistry in approx. 24 to 36 hours. On 220 volts, it heats the Portable Baptistry in approx. 6 to 8 hours. NOTE: During the heating process, the Portable Baptistry must have the Thermal Cover in place to prevent heat loss, and to ensure Heater efficiency. For other Baptistries that do not have a thermal cover, one may be purchased from PortableBaptistry.com. The Portable Baptistry Heater operates in conjunction with the portable Drain Pump that is included with every Portable Baptistry purchase. See diagram below. Amazingly compact, it is the size of a toaster (just 10 sq. inches) and can be conveniently stored on a shelf when not in use.